Key Players - Warren Zevon - guitar, harmonica, piano, keyboards, lead vocals. The record was chock full of guest players as well, and I will do what I can to make mention of them on each track. What caused me to blow off the dust? - Its been been a while for sure since I have listened, but I put out an "I need an idea of what to listen to" on Facebook recently and this was suggested. 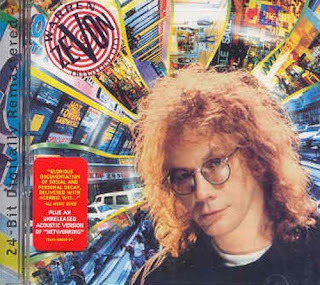 Overview - Warren Zevon had been releasing a steady stream of records (this being his 9th) and then in 1989 he released this futuristic "concept" album. At the time Zevon was interested in the work of a science fiction writer William Gibson. Even with guest players like Neil Young and Jerry Garcia the record was a flop and he was released from Virgin Records. FDF Comments (aka the songs) - A swirling barrage of keyboards open up "Transverse City" with flashes of some great bass fills by John Patatucci. The trademark Jerry Garcia riffs are head after the intro. Zevon sings in a monotone, gruff voice at a pretty good clip. With a buzz "Run Straight Down" fades right up, again with some swirling keyboards. Again, the track has another guitar legend on it. David Gilmour from Pink Floyd flashes his guitar chops on the dark/moody track, with a solo that seems to run the entire track. Jazz legend Chick Corea adds the piano work to "The Long Arm of the Law". Another track filled with flashy keyboards, but still allowing for the piano work of Corea to be up in the mix. The chorus has Zevon doing a call and response vocal run with himself. It is the piano work from Corea that really shines on the track. The vocals come right up on "Turbulence" a song that has a bluesy/bar room feel to it. Zevon is in fine voice and the backing vocals add a great touch to it Zevon even sings a verse in Russian. Another keyboard brings up "They Moved the Moon", the second track that Garcia plays on. The guitar is not a focus until later. The track has a very basic drum rap to it, with the keyboards holding long notes. The song never breaks its mold and the guitar work is not as outstanding as the lead off track. Speaking of guitar players, Neil Young appears on "Splendid Isolation", but not as the guitar player..as the harmonizer (he will play guitar soon stick around). This track is more up tempo and had begins with a nice harmonica run by Zevon. The track has a very happy feel to it, calling back to some of his earlier work perhaps. The piano gets a lot of focus, as does the harmonica. A stand out track. A nice full organ sound is found throughout "Networking", there are flashes of horns as well, but nobody is credited in the liner notes so perhaps they were keyboard fills? Getting back to his 'all-star line up" Zevon has Young play electric guitar, Jorma Kaukonen plays acoustic and Jack Casady (bassist from Jefferson Airplane) play bass on "Gridlock". How this song is not the theme to every news stations "traffic report" is beyond me. The angry driver like vocals the push from the backing musicians. "Roll down the Window, let me scream" is how just about everyone feels on their commute after all right? Young lays down a classic solo about the 2:10 mark that just melts the speakers, a rocking, fuzzed out (a little shorter than it should be!) solo. Zevon takes over the guitar on "Down in the Mall". The guitar is not as flashy as his guest players, but it does the track. There is some solid lap steel work (done by David Lindley) that adds a great touch a song that makes fun of the fascination with American shopping malls. The album winds down with a mellower track in "Nobody's in Love This Year". Zevon is more hushed and the soundscapes are filled with fluegelhorn and nice piano work. The horn adds a nice full sound. Where are they now? - Warren died of lung cancer on September 7, 2003. A minor, yet important, correction -- Warren died of mesothelioma, a cancer of the lining of the lungs. This is important because meso is preventable -- the only known cause is exposure to asbestos, whcih is banned in many countries, but not in the U.S. Jordan Zevon, Warren's son, is a spokesperson for the Asbestos Disease Awareness Organization and the Mesothelioma Applied Research Foundation. So, thank you for suggesting that be posted. (I appreciate any comments and will always work to make the post be as accurate as possible). FDF Personal Comments (aka the Live experience) - The only time I saw Warren live was October 16, 2000 at the old House of Blues in Cambridge MA. I was working for the radio station at the time and it was a cd release party for our "Live from the River Music Hall" series. I didn't get to meet him, but Warren played a solo keyboard/piano show that went from mellow to rowdy and back again. It was great to see him live. FDF Overall Take - In listening to this cd Warren put together a great collection of musicians and they all seemed to feed off one another very well. No song seems "out of place" and there is a good balance of faster and slow tunes. The flashy stand out moments hit you by surprise with the Gilmour or Garcia solos, they are really strong. Casual fans could get away with a best of collection, but if you are ready for some of his lesser known catalog cds, this is one to check out for sure. This week, a great bonus download! Warren live from Chicago in 1978! Release Date - June 15, 1990. What caused me to blow off the dust? - I can't tell you the last time I even uttered the bands name. I was looking at the cd rack and sure enough a "forgotten disc" pretty much screamed out to me. Its been YEARS since I have listened to this cd. Overview - Founded in the early 1980s the "goth rock/alternative" band based out of the UK took many years to be recognized on US shores. The band was the brain child of Jay and Michael Aston. The band had a series of member changes, and before this record Michael left the band as well. The band would find some success in the US in the mid 80s with some songs landing on college radio. Kiss of Life was the first record without Michael as he left because he felt the band was getting too "poppy". As a side note, their record was being recorded at the time of the World Series that was interrupted by the earthquake in San Francisco. FDF Comments (aka the songs) - A big guitar opens up the lead off single "Jealous". The big drums and guitars are a change from the bands material in the past. There is more a focus on bass, drums and this catchy guitar riff. A perfect song to release as the lead off single. The rocking guitar, with splashing of acoustic here and there bring up "It'll End in Tears". Aston gives a shiver to his voice that adds a cool touch and the guitars are pretty good in the mix, with simple chord progressions moving things along. The drums also get a little more punch in the mix. 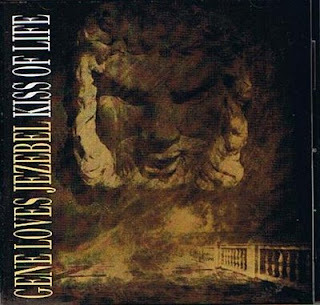 We mellow things out some with the title track "Kiss of Life". A track that blends plush acoustic guitar with a very "full" sounding electric guitar. The vocals are subdued some, and its more a mid-tempo rock track, not a ballad by any means, but slower than the prior two tracks. Drums bring up "Why Can't I?" a track that sits in the tight drum line into with Aston almost chanting the first few lines of the song. The bass chugs more on the track and the guitars are reduced to the occasional chord as Aston sings. A piano comes up and plays off the guitar as well. Aston hits a few notes way off the charts and there are some flashy guitar parts here and there. The track fades out with a lengthy guitar solo as well. Keyboards rush over the intro of "Syzygy". Aston speaks the first vocals lines and the track is done inside 30 seconds. It fades right up in to "Walk Away" and once more we are more in a mellow mood, but come the verse leading to the chorus the band hits down and the vocals are a little tighter. The song as a decent rocking vibe to it. "Tangled Up in You" was another song that was a single to college radio and much like the lead off track its easy to hear why it was picked, big drums and guitars with a decent back tempo to get your toes tapping. Aston has the quiver in his voice but it fits the song perfectly. A song that the indie rock goths adopted as their own and it made it on many mix tapes of the time. The electric and acoustic guitar feed off each other in the intro to "Two Shadows". After flashy intros the band sort of sits back some, and the the track is sort of "ehh". There are too many of these moments honestly. "Evening Star" opens with more of a pounding drum and single electric guitar really getting a chord workout. The bass chugs and then when Aston comes in it sort of falls a little flat once more. Musically it has potential, it never gets flashy, but it has a big sound that could be harnessed more. The album wraps up with "I Die for You " another hushed acoustic number. Where are they now? - Jay, James, Peter and Chris still perform under the moniker "Jay Aston's Gene Loves Jezebel". There have been many issues with the bands name and both brothers have toured under the same name. Micheal's version seems to be less popular but he owns the rights in the US. The bands have swapped jabs on myspace and Micheal even had Jays version of the myspace page taken down at one time for copy write infringement. Echo and the Bunnymen show at Great Woods. I don't recall much of the Gene Loves set, but I remember New Order being boring beyond words. FDF Overall Take - There are a few big rock star moments on here and you can tell the band was coming off a pretty big personnel change. The songs that are 'good' are real good but the songs that are even average don't hold my interest for very long. I think a "best of" collection might be all anyone really needs. Here is a myspace page. What caused me to blow off the dust? - I heard a a later track from Ben recently (Steal My Kisses) and realized it has been a while since I had listened to any of his cds. 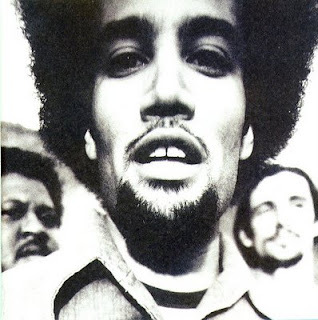 Overview - This is Ben Harper's third cd, and second w/the Innocent Criminals. This album was largely written on the road while touring in support of the bands prior album. Ben would adapt a weissenborn into his playing repertoire even more. The instrument looks a little like an acoustic guitar but its played flat on its back in the performers lap. Ben, and the band continue to have popular and critical acclaim to this day. FDF Comments (aka the songs) - A deep guitar groove with drums brings up "Faded". Harper has an effect on his voice that puts a little compression that meets phasing. It is a cool effect and the bass work is terrific. At the 2:30 mark there is an acoustic breakdown that almost confuses the listener since it was so intense leading up to this part. The grinding riff is a show stopper and the drums bring it all back together for a great finish. A slow fade up, with a blues riff feel bring sup "Homeless Child". The track appears to be recorded in mono with Harper giving a higher vocal delivery. The track keeps the sort of laid back blues feeling throughout. "Number Three" is a completely instrumental track, pretty, but too short almost. With a slow build up, and focus on the shimmer of Ben's vocals "Roses from My Friends" begins. Its a quiet laid back song, then the hammer drops and the players spread their collective music wings. There is a guitar solo, not too flashy but it gets the point across strongly. The bass and guitar feed off one another great on this track. There is a false ending that is awash with some droning keyboards. The clack of the drums set "Jah Work" in motion. The song has a very "flamenco" feel to it, and the cymbals on the drum set do that cool "splash" sound a lot. A very slappy sounding snare on "I Want to Be Ready" kicks off what turns out to be somewhat boring and plodding track. With a lot deeper of a groove "The Will to Live" comes up. The drums hit a little harder but its restrained at times, its finds it's groove and sits in that very slot which is great, and 45 seconds in we really get rolling to one of the stand out tracks on the record. The swooping bass lines alone are worth it. With some short bass notes Ben comes right in on "Ashes". A quiet track with a lush saxophone solo giving it a very jazz feel. Ben shines on the solo acoustic track "Widow of a Living Man". A quicker guitar on "Glory & Consequence" intro with the bass is a nice touch. There are some big bass notes drizzling over the top of everything as the song gets into the groove. There is a very heavy percussive presence on the track, making the song really quite fun. Another very fun track is "Mama's Trippin'". Musically speaking this is cast off of anything that Stevie Wonder laid down in the 1970's. Deep funk grooves with a great horn section and some deep bass slaps and pops. A terrific track. We mellow things out for the albums closer "I Shall Not Walk Alone". A single acoustic guitar and very subdued Harper on vocals, a mellow, but decent closer. Where are they now? - Ben is still active both writing and touring. The latest project he has in the works is called Relentless7 and they are expected to release an album in the middle part of 2009. FDF Personal Comments (aka the Live experience) - I have seen Ben Harper three times, but all three times were as a support act. The first time was for the Dave Matthews Band June 7, 1996 at Great Woods, then September 15, 1998 for Pearl Jam at the same venue. The last time was at Foxboro stadium opening for Dave Matthews on July 9, 2000. FDF Overall Take - On some of his recent records Ben and I have grown apart a little. I am not sure if its the total laid back feel or what, but he is far to talented a guy to release some of the sadly boredom filled records in recent memory. Records like this spark a fire that has me wanting to go back and reach for both the new and older releases, just to be sure I really am not missing anything. All the tracks were taken from "The Will to Live" which you can buy here.